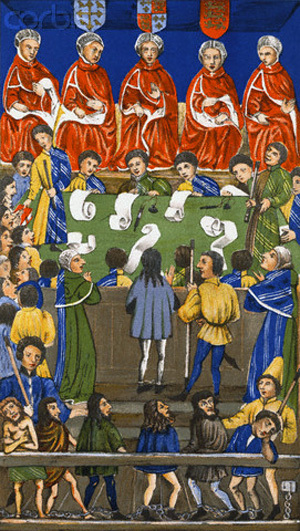 Today we will start to address the laws that governed in the Middle Ages to see if they had something that can define an organic society and, consequently, give us general principles to apply to social groups today or in the future. Based on this underlying interest, we should ask what comprised the laws of the kingdom, feuds, municipalities and guilds. To address these topics, we need to consider first that medieval society was much more complex than ours and, thus, gives jurists many more headaches, just as studying a human organism, which is very complex, causes physicians more headaches than examining a single cell organism. Everything that is more developed tends toward complexity, and the human society, composed of beings that are simultaneously material and spiritual, naturally has a great complexity. 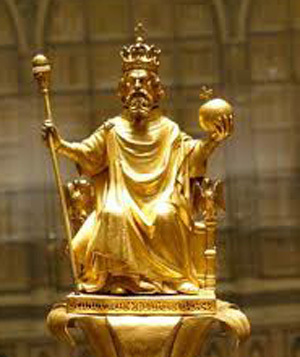 The starting point of the complex theory of medieval law is the idea that the true lord of the kingdom is not the emperor, the king, or the feudal lord, but the Natural Law, whose origin is divine. This observation is not mine; I borrowed it from Prof. Olivier Martin from the Law Faculty of Paris. He sustains this thesis as the basis of the medieval conception of Law: God, author of Natural Law, is the source of all law. This understanding is diametrically opposed to the modern conception of law. Today, the law is made by the State. The State is represented by an Assembly, which issues a law. This law is considered sovereign because the will of the State is taken as sovereign. Above it, there is no other will. In the Middle Ages, Law presided over the entire social-political organization: Everything should be according to the Natural Law. In turn, Natural Law was universally understood in Christendom as the will of God engraved in nature. Human intelligence is capable of discerning the rules of Natural Law. However, since at times men can misinterpret these rules, God gave them the Decalogue as the supreme pattern of His will that should rule the whole realm of Law. It is the Law of laws to which all countries must submit. No human authority, be it that of an emperor, king or any other, can revoke it. Now then, since the interpretation of the law of God inevitably falls to the Catholic Church, she assumes a pivotal role in the temporal sphere. The basic law of all Christendom is the same law that was given to the Church to guard. She is charged with teaching this law, preserving it from false interpretations, and enforcing it by mean of penalties. Therefore, the ark of the law, its guardian, its depository, the legislator par excellence of all Catholic nations happens to be the Catholic Church. Other laws – those made by kings, municipalities and guilds – are only regulations that derive from this principal law. Here in this room there are some lawyers and law students. They know the difference between law and regulation. In our contemporary Civil Law, the Congress votes to pass a law, the President promulgates it, and, then, he defines its regulations, an ensemble of codes that allow its application. Well, the laws of the State are turned toward the Law of God, just as the regulations made by the President turn toward the law approved by the Congress. Having set out these types of law, we will now start to study the most interesting of them, which is the consuetudinary or customary law. On one hand, he is limited by his own will, which means that when he signs a contract, he cannot violate the terms that he obliged himself to observe. On the other hand, he is bound by the limits of the law itself. The law is a command issued by the competent power that imposes itself on the will of the citizens, with or without their consent. Therefore, in Modern Law, except for a few freely accepted contracts, everyone is subject to the single law established by the State. In the Middle Ages, a new type of law appeared that characterized, in my opinion, the greatest originality of Medieval Law: It was consuetudinary law. We know that consuetudo in Latin means customs. Consuetudinary law, then, is the law of the customs of the people. To understand well how this type of law was born, we need to study the juridical and political conditions of the Middle Ages. The consuetudinary laws, which constituted one of the greatest legislative treasures of all times, were the result of one the greatest catastrophes of all times. This shows us that when man is upright, when he seeks God with all his heart, despite the disasters and problems that may fall over him, he ends by working marvels. The Carolingian Empire was organized following the model of the Roman Empire. In the Roman Empire the organization of the State was similar to the Modern State, that is, the Emperor, who stood for the State, made the law and everyone was obliged to obey it. Only the Emperor had the right to make laws. The Carolingian Empire was based on this presupposition. After Charlemagne died, and even in the last years of his life, a shadow of sadness fell over the whole Carolingian Empire. In the 8th century, when Europe has just managed to recover from the first wave of barbarian invasions in the 5th century, a second wave rolled in; the same disaster entered the scene again. The last days of Charlemagne saw a new wave of invasions of Vikings into France.